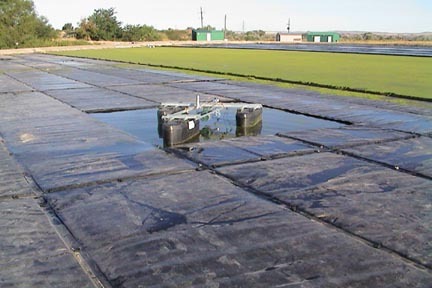 Layfield has developed unique cover materials for the purpose of preventing the buildup of algae in water. These covers exclude sunlight to prevent the algae from forming.Our REVOC Insulated cover also suppresses temperatures so that sunlight-heated water does not contribute to algae growth. All of Layfield’s floating covers will help prevent the buildup of algae. Our REVOC Evaporation/Algae control cover is designed to be the least expensive option for algae control while our REVOC Insulated cover helps you control your process water temperatures while keeping algae in check. Eliminating algae from your waste water treatment pond can help keep equipment such as aerators operating efficiently and prevent fouling of piping and outlets.